Do you know how to make a paracord lanyard? Paracord is one of the most essential and versatile tools you can have with you on your camping or hiking trip. It can be used for so many things, such as a bootlace, stringing up a tarp to serve as a tent, or hoisting your camp provisions into a tree so that a bear can’t get to them. However, in order to put it to use, you need to carry a lot of it with you, and that’s not an attractive option when you’re trying to maximize on the space in your backpack. Thankfully, there are ways to get around this, and the best way is to weave intricate designs out of your paracord to make a lanyard or bracelet. You’ve probably seen plenty of these in outdoor sporting stores. They’re cheap and durable, but instead of shelling out money for these nifty tools, you can learn an easy way to make them yourself. This article will provide you with paracord lanyard instructions so that you can create a nifty and stylish one in no time. In fact, there are so many different knots to choose from that you may not be content making just one. Soon, you may end up with a home filled with these beautiful lanyards, but they can also make wonderful gifts for your friends and family members. If you’re interested in exercising some entrepreneurial skills, you could even sell these online as a side business. Once you’ve made one, you’ll get instantly hooked into making more. Paracord is extremely strong, especially for its lightweight. Once used in the cords of parachutes, people have started putting them to different uses that have shown just how versatile it can be. The threads can be separated to be used as sewing thread of fishing line, or the cord can be kept whole and used in making splints or tying up your gear to carry it around. The texture of the cord itself is quite smooth, meaning that it won’t chafe your hands as you use it. And with the bright colors that it comes in, it increases your visibility, which can be important in emergency situations. You’d do well to have a length of paracord on you when you’re out in the wilderness, and need the means to make your experience much easier. Lanyards are a good way of keeping your keys or other personal effects on your person without having to fish around in your pockets. It also ensures that they don’t get lost, especially if you’re using durable paracord to keep them around your neck. In learning how to make paracord lanyard, it’s important that you exercise patience in learning any of these knots. They do require some practice, and it’s easy for your first time to be full of mistakes. a carabineer or jump ring. The most common knot to use in making paracord lanyards or bracelets is the cobra knot. This is because it is easy to do and is the foundation for learning how to do some of the other knots. Here are the instructions for doing a cobra knot. For more easy paracord bracelet instructions, see our article on this topic. First, use two lengths of paracord, approximately 2 feet long, and it’s best to use different colors so that you can see how the knots should be made and make it easier to remember the pattern. Tie each paracord to your carabiner so that you have about 1/3 of the length of the cord that you’ll be using to make your lanyard. Make a simple knot like when you’re tying your shoes. Then, using the cord on your left, bring it under both strands so that you have a C shape on the left side. Take the right cord, bring it under the end of the left cord and over both cords to go through the C shape that you’ve made. Pull both ends to tighten. Repeat the same steps, but with the right side first and you’re going to keep alternating until you’ve gotten your lanyard as long as you want it to be. Once you’ve gotten to the desired length, cut the paracord and use your lighter to melt the edges so that the knots stay tight. It’s advised that you measure the length of the lanyard around your neck before you do this step to make sure that it fits. If you need some help following these instructions, there’s an easy-to-follow in the above video. The fundamentals for making paracord lanyards are the same; the only variation there is lies in the kinds of knots and colors that you choose to use. There are a wide variety of fancy knots that can definitely serve as a fashion statement, as well as serve as a testament to your skills. Check out also our easy instructions on paracord knots to help you with more options. This is a knot that looks wonderful and almost delicate in design. It resembles the laced-up look of sneakers or the back of a corset, and can be very fun to do. To get started, you need to use 2 cords of different colors in order to make it stand out more and make it easy for you to keep track of your knots. Holding your cords side by side in your hands and starting in the middle, take your bottom cord and create a loop in the middle on top of your top cord. Pinch the cords of the loop together, and wrap the cords across the front of it in an X shape. Turn it over and wrap the cords around again so they’re side by side, but don’t do this too tightly. Taking the ends so the cord that are forming the loop, pull them over and through the wrapped cords, as well as between the cords of the looped cord. This should secure the previous knot in place. Tighten the cords and adjust so that they fit well together, and move the small loops to either side. Turn your work back over, make the X shape again, and repeat the steps until you’ve gotten to the end of your paracord. You can use a diamond knot to finish the end, providing enough of a loop for a jump ring or D-ring to fit onto. Above is a video on how to do this knot, and includes how to do a diamond knot. This knot uses three cords, so it’s a good idea to have a bright contrasting color. With this knot, you’re going to start exactly the same way as the corset spine, except instead of wrapping around to the back, you’re going to take the two ends of your loops cord and insert them through the loop and over your X shape. Turn your work over and slide the legs of the new loop up and insert the end of your third cord through this double loop until you get to the middle. Tighten all the ends and turn the piece back over to the front. Use your first cord to make an X shape, turn your work over, and make another X shape on the back. Insert the ends of your looped cord through the X and the legs of the loop itself and pull through just as you did with the corset spine knot. Turnover and start using the same pattern on the third paracord: make an X, turn over, make another X and insert the ends of the looped cord through the whole thing. You’re going to repeat this process, alternating between the two paracords. Above is a video of the whole thing. One cord is going to serve as the middle cord for the entire design, so you only have to focus on manipulating one cord to make all of your knots. Starting in the middle, make a loop in your middle cord and keep it on top. Wrap the right end of the bottom cord over the middle and under the left cord. Wrap the left cord behind the looped cord and bring it up and through the loop made with the right cord. Tighten your knot. Bring your left cord over the first leg and then under the second leg of the looped cord. Bring your right cord under both and through the loop made on the left side. Repeat the same motions, making sure that you keep adjusting the middle cord so that it remains in a single line. To finish your work, simple do another of the same knots on the end, trim the edges and melt them to the body of your work. Then make a diamond knot on the end of your looped cord to finish it off. A helpful video for this knot can be found above. This knot is good for beginners, as it only uses a single paracord. However, that means that you’re going to need to get a really long length in order for your paracord lanyard to be long enough to use. You’re going to start your work at least 5 inches from the end. Cross the cords to make a loop, and insert your paracord through the loop. 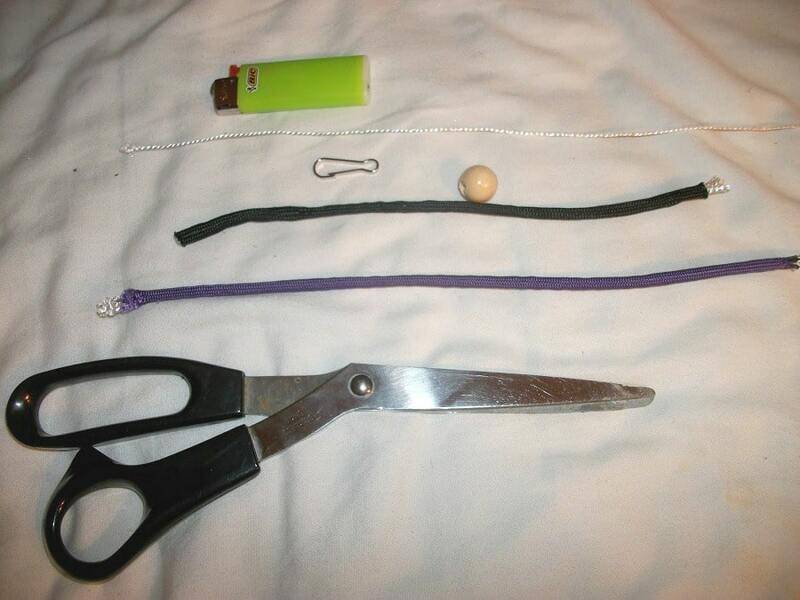 Pinch another loop together and pull on the 5-inch end in order to tighten the noose and create a knot. Feed the end of your cord through the front of the loop, leaving enough to create a new loop and tighten the old one. Feed the end of the cord through the new loop, and repeat the process all over again. Once you get to the end, feed your end through the last loop and tighten it into a final knot. Cut and melt the ends to the body of your work. A jump ring can be fitted through the loop of your final knot so you can attach keys or any other object to your lanyard. Above you can watch a simple video that shows you how to make this easy knot. A snake weave is very simple to do, and uses two length of paracord, preferably of different colors. This is using the pre-twist technique. Using one length of paracord cross the lengths over to make a loop. Then continue twisting the cord at equal intervals until you get to the sixth cross-over. Turn the twisted cord over so that the loop is at the bottom. Take your second cord and loop over the middle of the crossed cords. Loop the right cord behind the twist and have the cords slightly apart. Insert the left cord into the twist, behind the right cord, and through the front of the twist. Repeat the same process with the next twist, until you’ve made the last cross in the loop at the end. You can finish the ends with any knot you like in order to attach a jump ring of any kind. Above is a useful video that shows the step-by-step process. Starting with your two cords, start in the middle and make an overhand knot with one over the other, leaving a loop in the middle. Make sure the knot is tight. Take the left cord and place it behind the two in the middle. Place the right cord under this cord and wrap it over the two middle cords. Now take the cord that is now on the right, bring it underneath and to the left. Take the cord on the left, wrap it underneath that cord and over the two in the middle. Repeat this process back and forth until you get to the end. To lock the end, make a loop with the cord on the right and feed the left cord underneath and through the loop from the back. Tighten the knot, and make a second knot exactly the same, but on the opposite side. Trim and melt the ends to your work. Now to get your wavy look, simply slide the twists of your external cords down the length of the middle cord so that you can see the pattern. Adjust them accordingly so that your length of weaved paracord takes on a wavy appearance. This is certainly not an exhaustive list of the knots that can be used to create your work. In fact, there are so many different kinds out there that there simply isn’t space to fit them all into one article. They range from easy to very difficult, so there is definitely always a challenge to try something new and create more intriguing projects that you can wear or give to friends. Which one will you dare yourself to try first? Paracord is definitely becoming more and more popular with all ages and people from different walks of life. Learning to make a paracord lanyard can also be somewhat therapeutic both mentally and physically, as you increase the dexterity in your hands. We certainly hope that these paracord lanyard instructions were beneficial and will encourage you to take on one of the most fun projects for campers, hikers, or any person interested in craft. See our earlier article on the many uses of the paracord to give you more ideas of its versatility.